I had a gentleman come down to the boat recently to give me some quotes for doing some work. There is so much that needs doing. I didn’t go into this boat thing naïvely or ignorantly. I knew there’d be regular maintenance (just like on a land-based home) and I knew that maintenance would be costly (because hello boat and hello life). I had a plan. A best laid scheme, even. What I didn’t count on was for those plans to be essentially laid to waste. The plows that can dig up a little home so unexpectedly, yet so thoroughly. They even dig up the contingency schemes. I am discouraged a bit. And having to recalibrate paths and plans is disheartening to me. I find that I am severing dreams and hopes again. Temporary situations become long-term accomodations, sometimes permanent, and it’s important to acknowledge that those things ARE actually the way they are, and that it isn’t not counting one’s blessings or needing advice or needing to work harder, but rather, once again, a steeling of the will to continue forth in the absence of the hope one has held and to create a life where one actually is. All of the choices seem to loom with terrible consequences and I ache at having to concede. This entry was posted in Practical Matters on November 12, 2015 by outofthebilge. Living aboard in Southeast Alaska is most sublime in the summer. The docks hum with all kinds of wonderful activity. The harbor I’m in has a mix of pleasure and work boats and some of those boats do double-duty as pleasure and work. There are a few liveaboards as well. All summer, folks to and fro with carts full of supplies, families with rolling suitcases, and dogs along our docks. Always dogs around here. Charter operators haul down food from Costco for their clients (the ones with the rolling suitcases!). Commercial fishermen have Home Depot and Western Auto stuffed in their carts with hoses and pipes and line and buckets and lumber- all manner of interesting accoutrements. Sanders and grinders sound off as evidence of people giving their boats the repairs and maitenance needed. And I missed this. Well, I was here until mid-July (not including a quick trip in June) so I did get to see that rainbow above. But July, August and September are some of the best times to be in Southeast! I still feel like I’m shaking off winter until about mid June. But, family obligations kept me South for a long time this year. And I never did get to really shake off last winter and put on summer contrary to some of the photographic evidence from May and June! 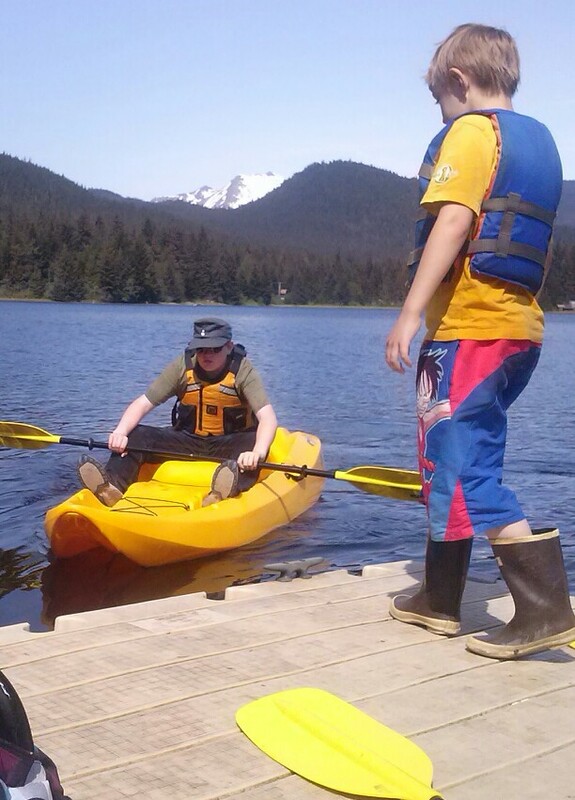 Here are my two boys in May on a nearby lake. They got to try stand-up paddleboarding and also kayaking. They of course want a paddleboard and a kayak and, I, of course, AGREE with the desire! And now, it’s November and I feel as though I didn’t get a summer but the temperature gauges are all in the 30s and the rain is cold and icy and it almost feels like snow, but not quite because it’s that time of year for the really miserable, soak-you-til-you-get-hypothermia rain. I feel a little lost. But here I am, in the dark a few days after the time change. My boys are still sleeping. We brought a dog back from our travels. My daughter lives down south now and we have her dog again. And I’m trying to assemble myself and my thoughts and grasp the reality that IS rather than the hope that isn’t. This was the summer I was going to haul out, scrape the bottom, paint everything, have a roof put on, add a tophouse. When I purchased the boat, the roof wasn’t finished. It is raw plywood covered in a couple layers of plastic. It’s survived two winters with me. I thought that was probably pushing it enough. And this isn’t the time to start roofing jobs. This summer DID see some positive changes and upgrades, however. 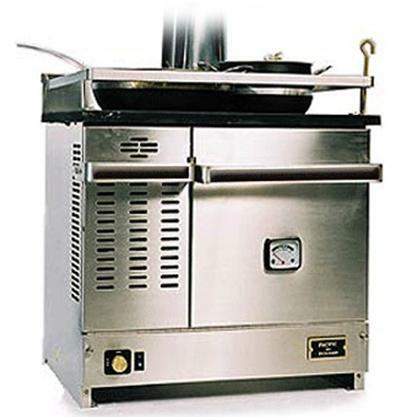 I have a propane gas cookstove now rather than the Dickenson diesel stove. Two lovely young fisherman bought the Dickenson and supposedly put it on their gillnetter. Earnest, hardworking young men in their early twenties. I get a little verklempt when meeting these kinds of people. This is my dear friend who helps me with so much pulling that Dickenson out! He manhandled it out the door and literally bicep-curled it up into the cart to haul it to his truck! I get nervous when he does stuff like that. I depend on him to keep that body of his working and injury-free. This is my pretty, shiny, brand new cookstove! See those four burners? You know what that means? That means someday I’ll be able to fry eggs and bacon. Seriously I am excited about that. The installation isn’t finished. I could use it right now, but it’s still a little jerry-rigged and ya know, I am just not going to go with jerry-rigged. I have enough of that in my life. So, I’ll wait until it’s properly installed. It’ll come. So yes, I’m still cooking in the toaster oven! So yeah. November. I’m really struggling with it being November already. This entry was posted in How Do You...?, Practical Matters, Uncategorized on November 3, 2015 by outofthebilge. A while back, I mentioned I was getting some canvas work done on the boat. Several folks were confused because they knew I didn’t have a sailboat and hadn’t really heard of using canvas for other applications. The aft deck on my little vessel is enclosed with a custom-made aluminum frame and canvas. It has large “windows” in it that do great job of letting in light whilst keeping weather out. But, it didn’t used to. It used to have large windows that were cracking and holey, that did a great job of letting weather IN. Over time, the vinyl of the windows gets brittle. With three active kids and one brain-full mama, well, sometimes brittle vinyl gets injured. I did some jerry-rigging with Gorilla Tape and had moderate success. It’s REALLY hard to get the vinyl totally dry on both sides when there aren’t several days in a row of great weather. There’s so much moisture that condensation on the inside is nearly impossible to get rid of without many dry days. You can understand why little beads of moisture on the vinyl might not allow for super Gorillla Tape success, no? I didn’t have the luxury of dry days. I had a handy-dandy, reasonably absorbant towel. And also, a sprinkling sky. So, moderate success with the Gorilla Tape. It was also pretty ugly. I’m going to step aside and indulge in some personal tale-telling. If you know me from Facebook or in person, you know I’m not super big into appearances. I wear my worn out Xtratuf boots daily from October through March and change to flip flops sometime in April. I don’t wear makeup very often, or do my hair, or tweeze my eyebrows. I have yet to wash my car that I bought last September. Most of that stuff just doesn’t matter to me. But. That ugly Gorilla Tape? It bothered me. A lot. Even though I’m not super concerned about my own personal appearance, or appearances in general, that black tape criss-crossing my entrance really bugged and disheartened me! I’m super visual so I’m sure the trashy look was exacerbated, at least in my mind, by that. Additionally, I know people judge so much based on appearance and I really didn’t want to be thouhjt of as the “jerry-rig”, “white trash”, “harbor rat” kind of girl, you know? I had worked really, really hard to get to here (still working hard!) and when something looks crummy, it devalues the effort and time you put into it. My little fixes did help and we got through the season as we waited for summer to arrive. Summer did not really arrive. As the months wore on and fall approached, I knew I couldn’t let another fall/winter/spring season come and go with the vinyl falling apart. I needed that area to be free of too much precipitation excitement. This is where the canvas repair comes in. I’m going to say up front that I love my canvas guy. He came and gave me an estimate and then took that sucker apart and repaired it and brought it back! Within a week or something crazy! He put in new zippers and new beautiful vinyl. It was a lot of money. About $1500. You can see the opening where my friend is standing. I have one just like it on the other side. It zips in and has a clear, vinyl window just like the ones you see on the back. It actually zips around pretty snugly. I love that. Snug is good. You see, in addition to the windows being not so awesome after more than a decade, the zippers on my door panels had quit working. Well, one side of that I got some help and managed to get them put together with clamps. But, the side we used to get on and off the boat could not be clamped shut. And ooooohhhhh my reader – the wind howls sometimes and it scares me so! It lifts the flaps and makes them fight to stay attached. More than once I pulled a Scarlett O’Hara and hid under my covers just praying that whole canvas structure wouldn’t fly away. And my canvas guy? It turned out he’d been the one to custom build and install that sucker in the first place! So, now you know that canvas is for more than sails and if you’re ever looking at a boat to purchase and it says it has custom canvas or covers, you know how expensive it can be if a couple zipper and window replacements cost $1500! This entry was posted in Practical Matters, Staying Warm, Terms and Phrases Explained, Uncategorized on March 23, 2015 by outofthebilge. The Insanity Can Set In for Months! We wrestle cabin fever with varying degrees of success from about October through March. Weather, daylight, schedules, finances and forgetfulness along with me being a single parent conspire against us. Living on the boat with kids, at least for me, is a LOT like camping. Snow and wet weather gear are bulky (hello space issue) and difficult to dry out. There is no “just wear your other pair of boots”. We don’t have room (or the amperage) for an on-site dryer I can just pop things into so they’re ready for the next day, nor do I have room to hang things to dry. We had raingear, but found it to be bulky and hard to store properly without it getting mildewy. Mildew is super appetizing, no? If it’s rainy or snowy AND windy, it can be downright miserable to be out and about. There is an indoor play area here but I have yet to figure out their hours and pricing structure in spite of calling, visiting, checking the website AND soliciting info from friends and strangers. I forget we have an ice arena (maybe because I don’t know how to skate?). There are lots of team sports type things, but they’re costly and not really practical for our drop-in lifestyle. In spite of all that, we have found some cabin fever helps that I DO remember (sometimes!) to do and can afford once in a while. For $20, I can get all three of us (my oldest currently living out of state) in a comfortable, warm theater watching something we all enjoy. Our Costco sells $19.99 movie cards worth $25 in spending power. What that means is, we go grab a card (and sometimes a hot dog) and head to the late Sunday afternoon showing whenever there’s a PG- or G-rated movie. (The kids are 7, 12 and 14. At the moment, my oldest is with friends in Washington.) I don’t feel at ALL obligated to purchase soda or popcorn. Sometimes I do it, but often, I don’t. I like the movies because I know exactly what to expect. The cost is reasonable and known upfront AND it isn’t a commitment. No signing up for a season of movie going. It’s not a club. It’s just week by week. We are at our church a LOT. Our church is so nice to us. It is hard to believe how kind they are (feel free to comment on that). We attend regularly on Sundays and then once a month they host a movie night with a kid and an adult feature. It’s fun. It’s free. The bathrooms are awesome and so’s the leg room. Company ain’t so bad either. 😉 I go to a ladies Bible study and my oldest goes to Confirmation once a week. We actually utilize our church building a lot for daily living, too. Hike is maybe a misnomer. I really like the British term “hill-walking”. It seems less strident and arduous. Hike always conjures up these super outdoorsy, fit, ooh-ahh boots and brand name jackets types of images and well, that’s not me. Hill walking on the other hand, seems much more casual, like most anyone could do it. We don’t do a lot of walking because I do forget about it and the weather/daylight issue. And in the summertime, I worry about bears. But, there are a couple places we enjoy going. 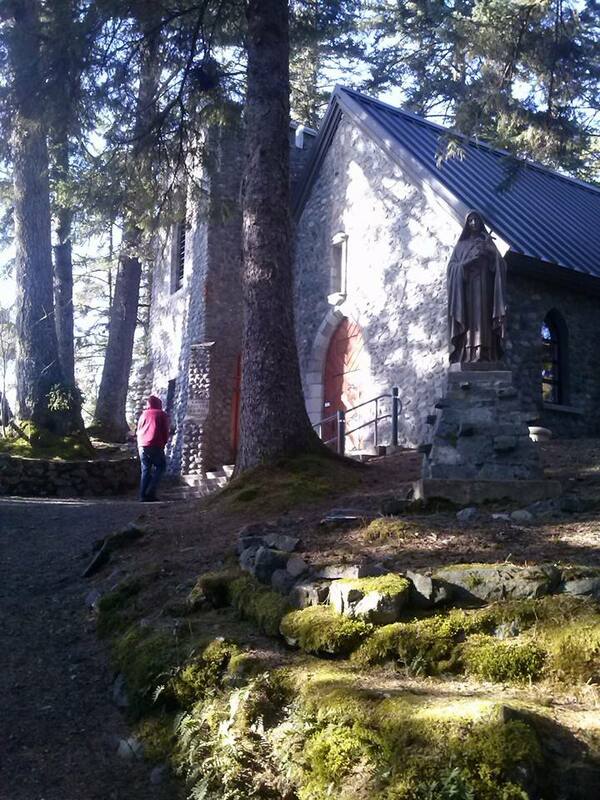 There’s a beautiful Catholic shrine nearby. We enjoy the grounds there once in a while. We have a neat trail on the site of a historic mine. This area has the added benefit of a playground for the youngest. Right by our airport, literally in the landing path of planes, we have a slick trail as well. The kids really like seeing the planes come in to land right above their heads. Another trail we enjoy takes us around one of our lakes. I like this one because it’s got a variety of terrain but nothing too steep for too long. I try to scope place out prior to adventuring out with the kids. I just really hate doing things “cold’. I really prefer to go new places with a companion and then take the kids. That’s how I discovered two of the four above. This one isn’t as awesome for the kids as it is for me. We have three or four theater companies, a symphony, lots of live bar music opportunities, a dance troupe, an independent film house and some really cool programs hosted at the local university. And tons more. There is just a LOT of music/theater/writing/artistic/intellectual opportunity here. I try to do as much of that as schedule and budget allow. Playgrounds present the same challenges as hiking so it’s not one utilized much in the fall, winter, and spring months. There is one just a couple miles away that my youngest really enjoys. It has lots of climbing structures, hiding places, swings, balance opportunities, slides… it’s just really great for physical play and imaginaton. At our local playground last spring. It was maybe 40 degrees. The lake behind was still frozen and people were playing hockey on it. We also use our local McDonald’s for the indoor play area. I hate going there. It’s uncomfortable. And loud. And I feel obligated to purchase something since it IS a business. And… my kids are usually hungry. And I get tired of saying “No.” But, it has come in handy as a drop-in place and there are usually other kids there so my little guy enjoys that. It is totally a sign of desperation when I am there, however! I don’t take advantage of this one as often as maybe I should or as I’d like. I can’t reciprocate by having people over since there just isn’t a place to put them. But I do have one friend with kids that I’ll ask if we can come over. This works better for my youngest than my oldest, but he’s usually the one chomping at the bit the most! So, he’ll play outside, or build with legos, or, play Minecraft with my friend’s youngest while she and I visit. 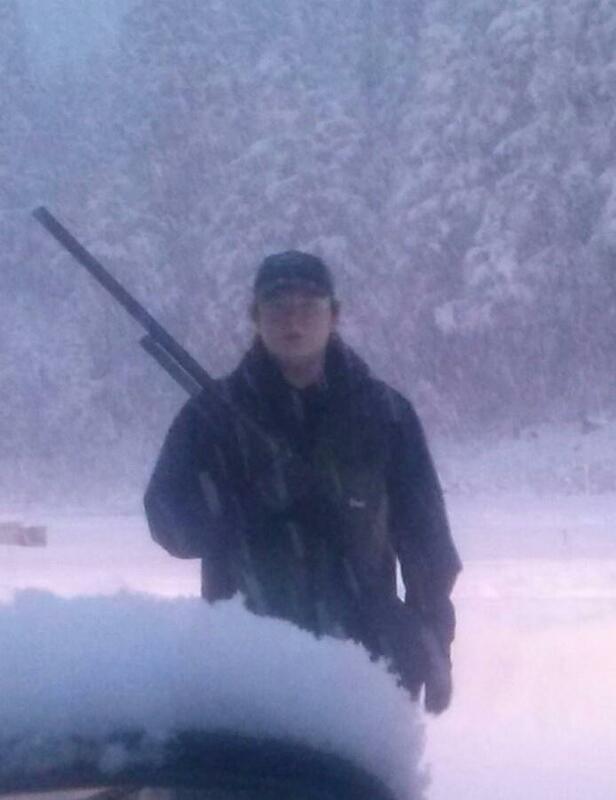 This winter was pretty abysmal for snow play. And maybe that’s why we struggled more this year with cabin fever than we did last. BUT, when we do have decent snow, I take the kids sledding. I love this activity. It’s cheap ($15 for each sled at Costco!) and easy to access and, if it’s cold, cold, cold, well, they don’t really get wet! Oh, and it’s something all the kids enjoy. Skiing and snowboarding are popular here and we have a resort close by. It isn’t an activity I’ve been able to really encourage too much (gear and money), but the school my kids attended last year did some downhill and cross country ski opportunities. My older two are homeschooling this year and my middle child had the chance to do ski lessons with our homeschool group, but the derth in snow put the big kibosh on that. However, when we do have snow, this will be an activity the kids can definitely take advantage of more frequently. In addition to the cultural events, we try to do the neat things offered in the community. Most recently there was a Winter Celebration with fireworks at the ski resort. That was really a fun time even though it was drizzly! We always see people we know at those things. I love the sense of belonging to this place as faces light up in greeting. Wow. This is quite a list and there are so many opportunities here. This winter we really struggled. I am so glad spring is coming and the daylight is coming. Once the temperatures are consistently above 40, even with the rain, we’ll be outside a lot more! I’d love to hear what you guys do for those times of cabin fever. Many of you have similar challenges with weather, transportation and finances. What ways have you found to combat the winter stir-crazies?! This entry was posted in How Do You...?, Practical Matters, Uncategorized, Weather on March 19, 2015 by outofthebilge. Resource conservation gets a lot of play in the small space living movement. I have to concur that my lifestyle definitely can conserve resources. At least some of them. At least I think he was being witty. And endearing. Of course we wash our hands. Pretty regularly. Dishes – weeeelllll, they get washed a little less regularly. (Please note that “a little less” is kind of like the opposite of hyperbole – a litotes maybe?) But, when we’re in a groove, we do dishes about once a week. Crazy, right? I may or may not explain more about the infrequency of dish washing. For the record, I wasn’t super “on it’ when I lived in conventional housing either. When we lived in a regular house we went through hand soap and dish soap fairly regularly and it got me to wondering why, here on the boat, we didn’t use nearly so much. 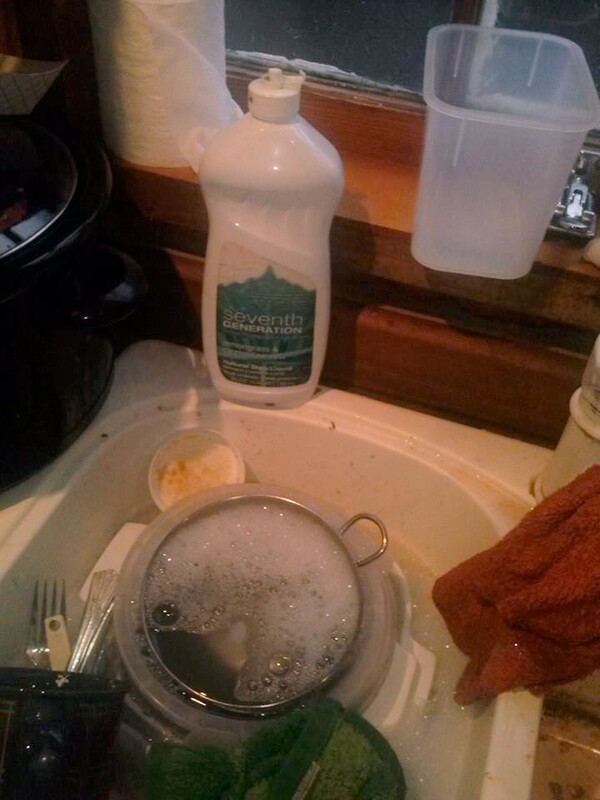 In a house, we had the large, Costco-sized jug o’ dish soap on the corner of the sink rather than a the petite, elegant bottle currently gracing our dish washing space. That giant bottle takes up too much counter space. My hypothesis is the smaller bottle causes less soap to come shooting out, hence effortless conservation! It’s easier to get just the right amount for hand or dish washing. I don’t know about the kids, but I use just a couple of drops on my hands and it seems to suds up just fine. Two other significant differences are, in my opinion, our overt water conservation and a significant change in dish washing method. Because we are not connected to a constant source of water, we have to fill tanks. This causes us to be very aware of water usage. The sink never gets left running. A smaller stream of water is used when rinsing soapy hands or dishes. It helps you see you don’t need as much as current practice indicate. When washing dishes, I don’t load up a sink of dishes and let them sit in soapy water and then forget, have the water get cold and then refill the sink with new hot water and new soap. We don’t wash a water glass after just one use. “Clean enough” is often, clean enough. If i fill the sink to do dishes and I can’t get to it before it cools, I’ll boil some water in my handy dandy electric kettle and add it to the cooler water. In the house, with unlimited hot water, I often didn’t fill the sink with water. (I’ve always hated sticking my hands in the water. I have weird sensory issues.) I’d run the water and wash/rinse as I went which of course diluted the soap in my dish cloth quickly. Now, I fill the sink on the left and then put the dishes to be rinsed on the right to be rinsed. It’s funny the things that strike you, such as dish soap usage. I’d love to know from you what things you’ve noticed in your lives that are different from past patterns or different from the American norm. 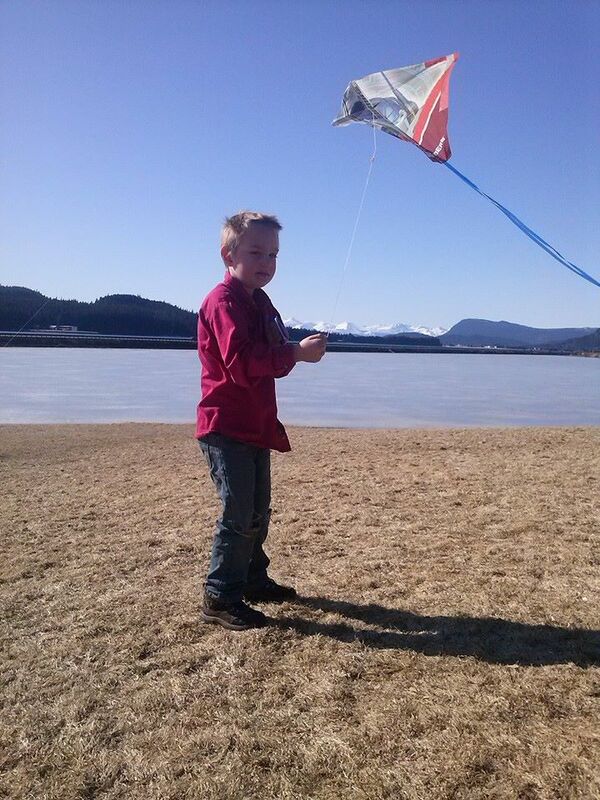 This entry was posted in How Do You...?, Practical Matters on March 14, 2015 by outofthebilge. I get asked a LOT about the challenges I face in cooking. This is an area I struggle with tremendously for a variety of reasons. The reality is, my facilities simply are not adequate to do what I need to do for healthy, varied food for a family. My goal is to eat grain and sugar free as my family does so much better with that. Additionally, I shoot for low carb too since *I* do so much better that way. “From scratch” just doesn’t happen, unfortunately. My cooking is done primarily in a toaster oven. I also have a crock pot but using that is more challenging because washing it is hard (which leads to another question – how do I do dishes? But that is another post for the future.) The photo above was taken prior to moving aboard. 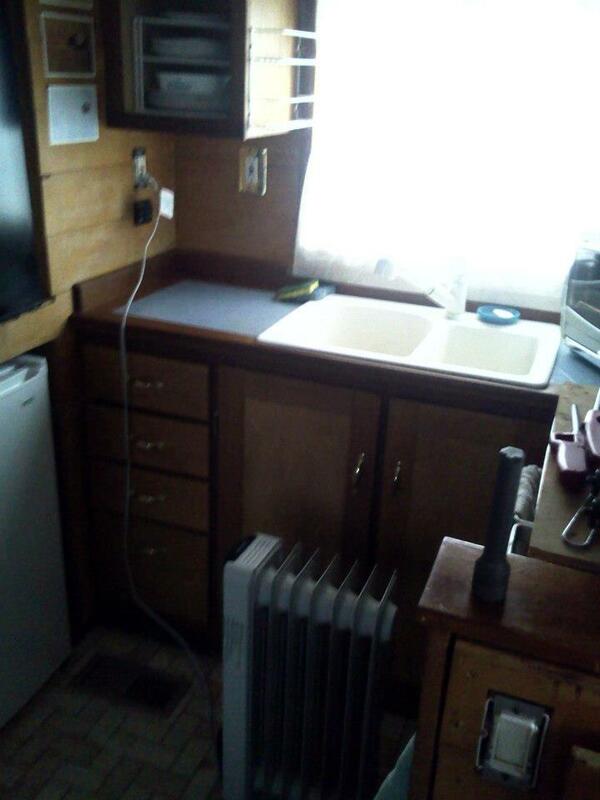 The space to the left of the sink is where my crock pot now lives and the spot to the very right is the diesel stove. I use that flat surface as a dish drainer when I wash dishes. I do not have a microwave or a hot plate or a stove with a surface on which to use a frying pan. So, the size of the units makes keeping too much on hand difficult. Cooking takes a surface to cut meat and veggies, to put the bowls and pans and cutting boards, to put finished product to serve. I am very, very visual. I need to lay everything out that I’m going to use. I cannot do that on the boat. Consequently, I use an inordinate amount of brain space trying to keep track of what I’m doing. Also, many things require a bowl of something to be mixed while something else sautes in a pan, etc etc. If I can’t mix it all together, it just doesn’t happen. There are no side dishes! Ha! My counter space is occupied by my crock pot and my toaster oven. What I’d REALLY like to do is install a small, propane cook stove in place of my Dickinson diesel stove. It would free up counter space AND I could do more than one thing at a time potentially. This is probably at least a $1000 proposition plus getting the right help to get gas lines properly installed, getting diesel lines properly uninstalled. Not out of the question, but very difficult for this already overwhelmed mama. I have a DOUBLE sink!! That is actually pretty awesome. Lots of boats don’t have a double sink. This allows me to hand wash on one side and rinse on the other. But, the sink is SMALL. My crock pot fills it up. And the faucet has to be wiggled to get it up over the lip of the crock. (That can’t be a good thing to do regularly, right?) Washing isn’t the real issue. Getting it RINSED is the issue. There just isn’t adequate clearance. I did go shopping for a new faucet that had more clearance as I figured that would be a good way to significantly ease things without a major overhaul. Faucets that will fit my sink are surprisingly hard to find! Cooking real food means using actual dishes of a certain size and getting those washed and rinsed is challenging. So, what do I actually cook? 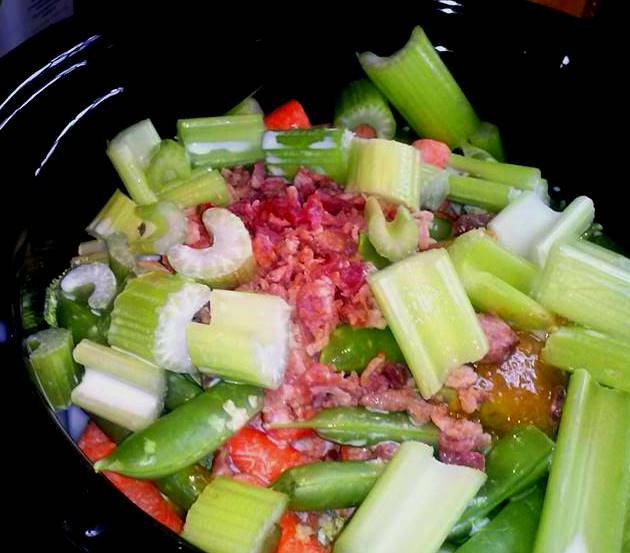 If I can slice it directly into my crock pot, I can cook it usually. If I can warm something in my toaster oven, say breaded chicken tenders from Costco, then I do that. I used to do a lot of alternative baking with coconut and other nut flours and I don’t do that anymore. I shop every couple of days. I go to Costco and think “Hmm. What is an actual MEAL. Oh, chicken tenders. We’ll eat those for dinner today, and lunch and dinner tomorrow. And apples. I’ll grab a flat of apples.” And that’s how it goes. Pretty romantic, no? When I first bought my boat, I lived on it alone and it was MUCH easier to fix things. I have much simpler desires than my kids. Also, being just one person I didn’t need to cook the quantity that is needed for 3 kids, 2 of whom are teens and have adult appetites. Keeping up with quantity in the toaster oven is difficult. I think we lived a year on the boat before I was able to get the crock pot. 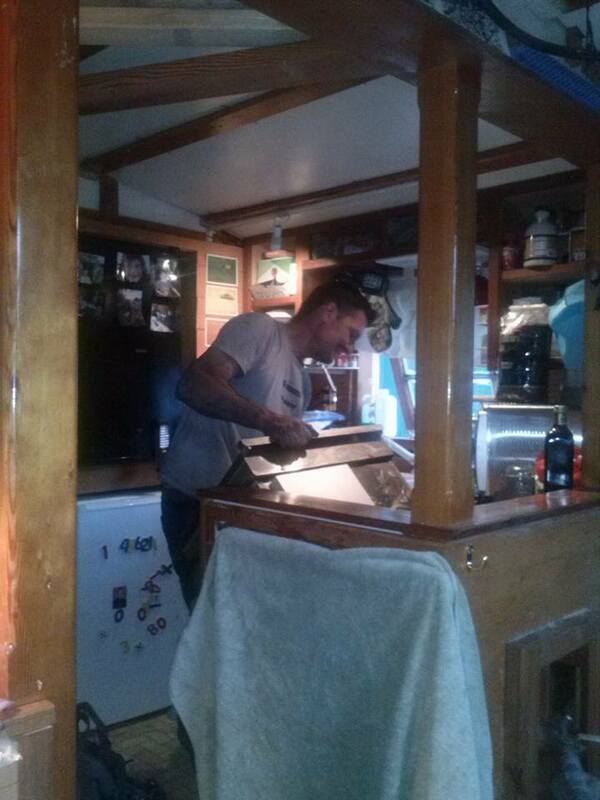 Honestly, cooking on the boat is a lot like camping. It takes a lot of planning and logistical work and is energy intensive. Do you live in a small space? What challenges have you encountered? What creative solutions have you found? Please comment! This entry was posted in Food, How Do You...?, Practical Matters on March 9, 2015 by outofthebilge. Small space cooking means simple cooking. As I’ve mentioned in other posts, I don’t have counter space to do any real prep. I don’t have a hot plate or a microwave – just a little convection toaster oven and a crock pot. This easy breakfast takes only 2 ingredients: frozen hash browns and sausage links. First, I lined the toaster oven rack with aluminum foil. Then I piled up a couple handfuls of organic hash browns (these are the Alexa brand from Costco). Next I lined the potato perimeter (I love alliteration!) with good breakfast sausage links (fresh in the Costco meat department). Bake at 350 or 375 for a while – say 15-20 minutes. Or more. I’m not awesome at that whole timing thing. Tip: Turning up the edges of the foil keeps any juice/grease from running into the bottom of your oven. I did find a thin layer of hash browns stuck to the foil. Someone recommended spraying the foil first. I don’t do that. For me, that’s just one. more. thing. to find a place for AND it’s just one. more. step. I need less stuff and less steps. But, it may be useful for you. I’d think you could lay the sausages like little logs and put the potatoes on top and that might be a good alternative. 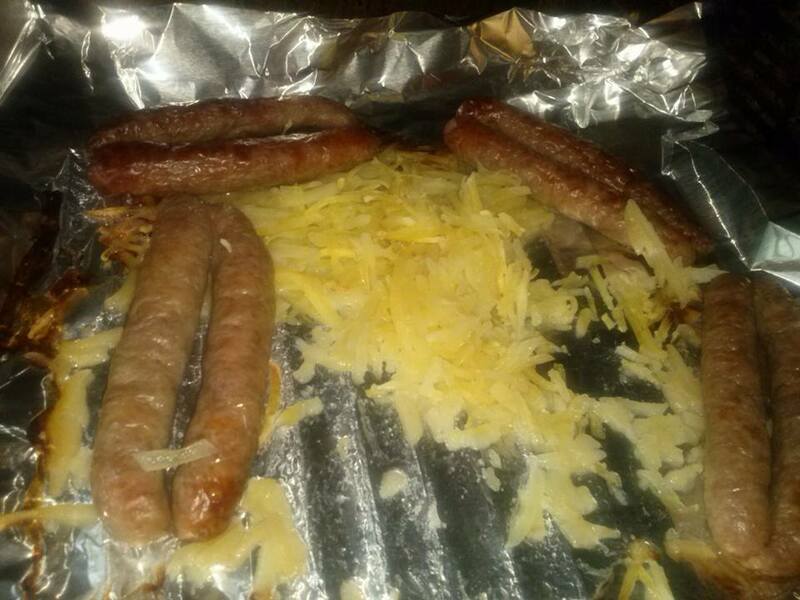 The sausages won’t brown up that way, so if that carmalizing, browning effect is important to you, keep that in mind. Someone else suggested breaking a couple of eggs over the pile. I haven’t tried that, but I’d think it would be good. Besides this being crazily easy and FAST to prepare I love, love, love that I don’t have a pan to scrub. I seriously love using foil as a pan. Crumple that sucker up and toss it in the trash once it’s cool. From my boat-living perspective, it saves on water which I really appreciate since we have to fill tanks less often when dishes are easy. I’d LOVE to hear some of your ideas for variations on this. I’m particularly interested in “whole food” additions that can be bought pre-packaged. Diced onions would be awesome. Leave me a comment with your suggestions! This entry was posted in Food, Practical Matters on March 7, 2015 by outofthebilge. 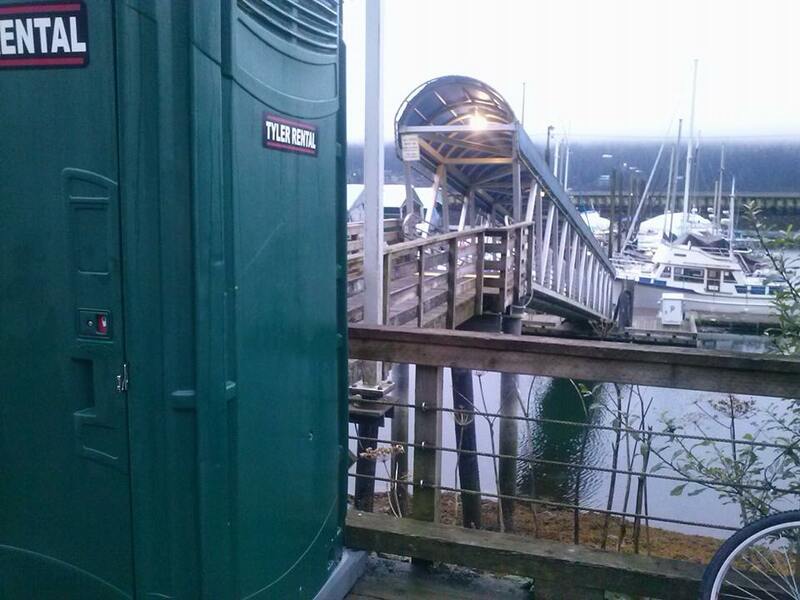 Pooping on the boat is a HUGE question for most people. Here’s the down and dirty. Our boat has a working head. Which is awesome. A head, for those of you who may not know, is boat-speak for toilet/bathroom. Since I’m pretty sure you all understand the basic biology of pooping, I won’t write about that here. But, I will explain our bathroom processes. Also, I’ve included links so you can get an idea about what the parts look like in case you’re curious. They’re all Amazon links so everything is fresh and clean and no grossness! But in case you’re curious about poop, check out this book The Truth About Poop. It will tell you more than I can! We have a slick toilet. It is a macerating marine head, not a regular household toilet. What is slick about it? It has a macerator built in. Woot! Here’s the process. We have a button on the wall rather than a lever on the toilet. This button activates a couple of things. It pumps sea water in, activates the macerator and pumps the poop to the Lectra-San system and then on out. So, we do our thing, wipe, press the button, the macerator makes it’s terrible noise (it’s really loud! ), the water swirls around the bowl, the stuff get sucked down, chewed up, sanitized and then pumped out. A macerator is a great contraption. It basically “chews” up the poop and toilet paper and mixes it with the sea water so it can be pumped through easily. We do not have a waste holding tank. We have a sanitizing system in the Lectra-San. Coast Guard regulations don’t allow for waste to be flushed off the boat without treatment, at least here in the harbor. There may be other regulations when one is underway or otherwise off-shore. Ironically, we could poop in a bucket (and I have friends that do) and dump it directly overboard with no legal issues. But, put that poop in a toilet and suddenly it’s a whole different issue. Click the links for the Lectra-San to get an idea of what it looks like and note the costs! I am NOT excited to have to replace it when the time comes! Our toileting hasn’t exactly been drama free. We’ve had some mechanical issues. We had an impeller fail. Twice. The impeller (click link to see what one looks like) is a surprisingly important piece of the assembly! We have gone without a toilet it more than once as we’ve had to troubleshoot and then get repairs made. Of course, what does one do when the toilet is out of commission?? Ah yes. An Alaskan standby comes into play. Ye olde honey bucket. 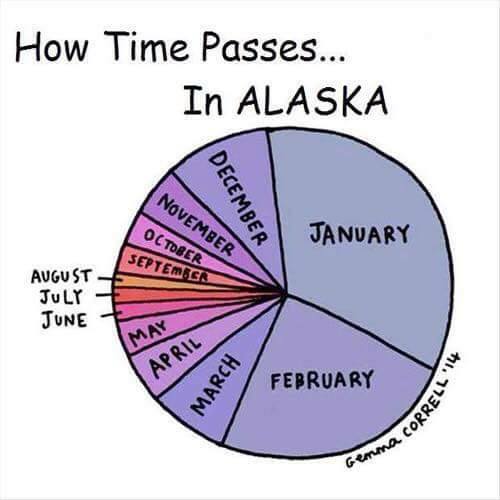 If you’ve watched Buying Alaska, you’ve probably got an idea about what I mean! Don’t know what a honey bucket is? A honey bucket is essentially an outhouse. 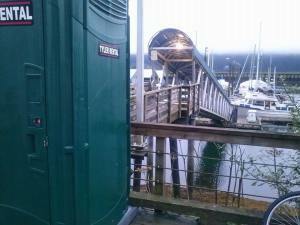 At the top of the ramps at our harbor, there are port-a-potties. When our toilet is out of commission, we use that. It is no fun trudging up the dock and ramp in the cold, windy weather of fall or spring! Even less so when you have to wait outside because one of your kids is too young to go by himself! Super fun, eh? Out bathroom is REALLY small, so it’s funny, but the honey bucket feels quite spacious. And there is absolutely no worry that one is using too much toilet paper! (Yes, that is definitely a worry I have!) And, there is no worry that someone isn’t flushing long enough to get all the stuff OUT of the system. (Yes, that’s a worry as well.) 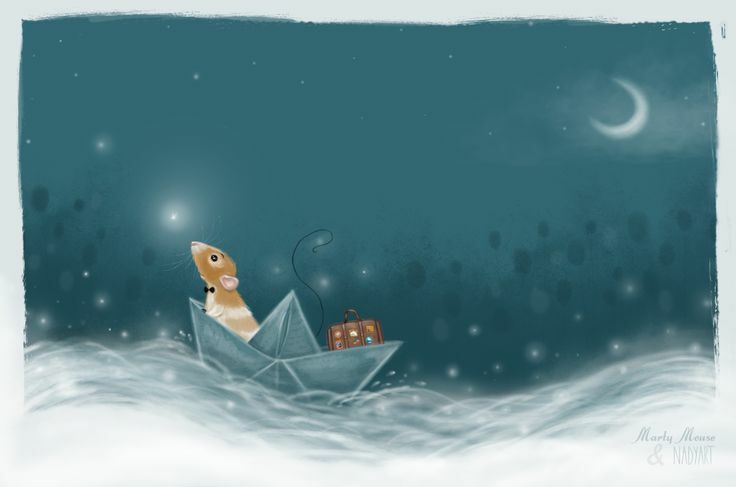 But, I still prefer the warmth of my little boat to the cold honey bucket! 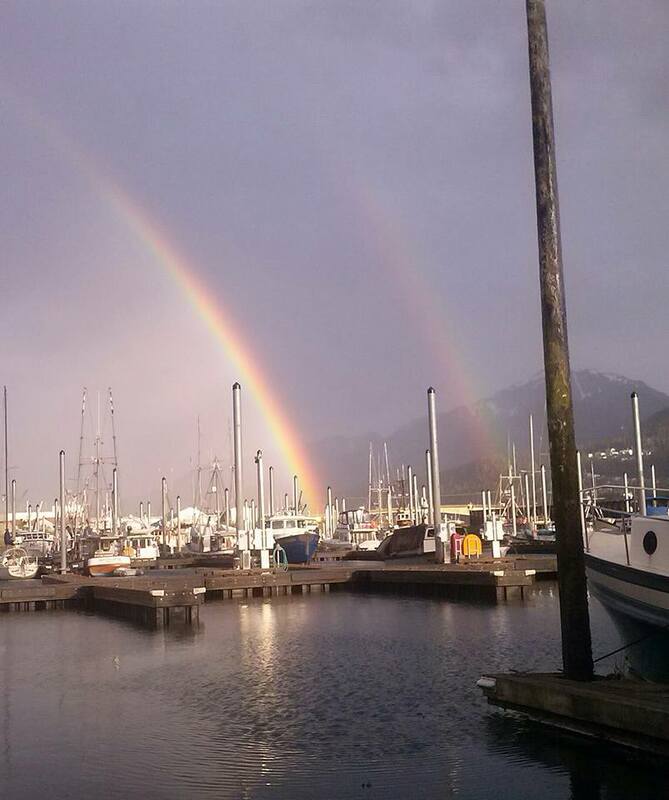 This entry was posted in Practical Matters on October 12, 2014 by outofthebilge. Cooking has b een a major, major challenge since our move to the houseboat. There are sundry reasons, most of which are purely logistical, and I’ll write a post detailing some of those at some point. You’ll note that I’m not big on measurements because I am sort of not awesome at following rules… Use what you have. This could be done vegan, vegetarian, and semi-paleo too. Throw all of the above in a crock pot. Add a couple cups of water. You may want more. I probably will but I wanted it to see how thick it would be. I like a thick soup on these damp days. Anyway, I’ll thin it up if needed. Cook on your preferred setting. I did high for 4 hours. I’m not a Queen of the Crock Pot like my friend Theresa. So, I don’t know if this will cook more quickly or more slowly. I’ll check it in a couple of hours. Taste it for seasoning and add salt, pepper, oregano, lemon grass.. whatever your sweet little palette desires. When it tastes yum, you can serve it chunky or you can do what I’m going to do: puree the life into it. I have this awesome Kitchenaid immersion blender. It’s red like the one in the link. I love it. I pureed sweet potatoes yesterday and today with it. It is definitely a crazy-awesome tool for any small space dweller! Anyway, that soup will be so smooth and delish!! 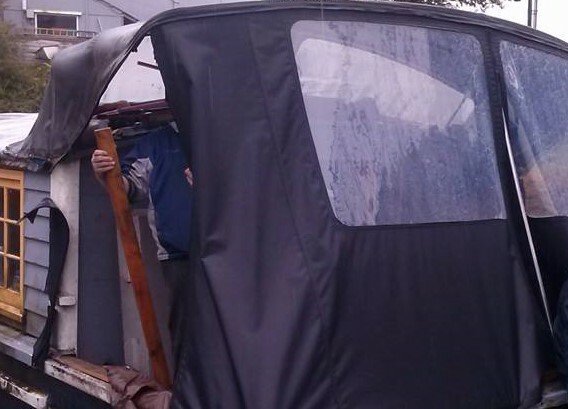 This entry was posted in Food, Practical Matters, Staying Warm, Tools for Small Space Living on October 7, 2014 by outofthebilge. The boat is about 200 square feet inside. We currently heat with an infrared electric heater from Costco. 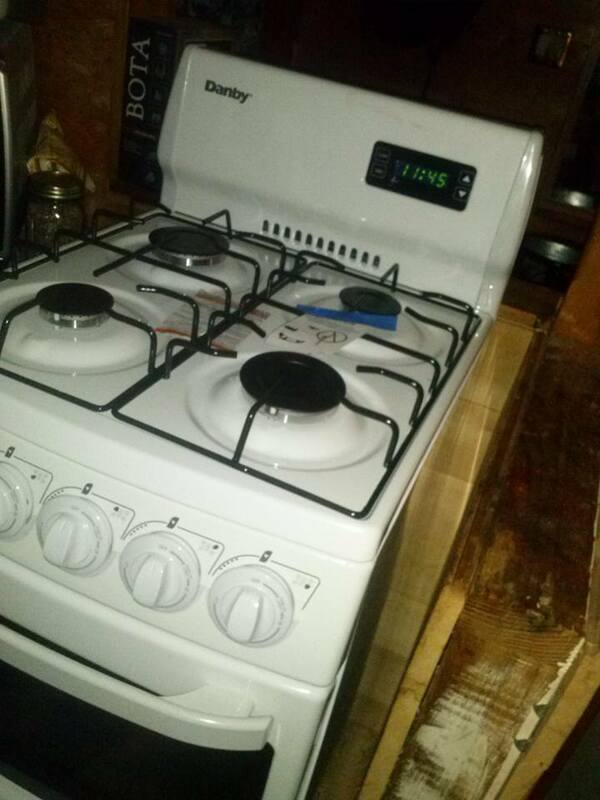 The boat came with a small oil burning heater called a Monitor (similar to the link to give you an idea) and with a diesel Dickinson stove. I took the Monitor out to make room for another bunk. Neither the Monitor nor the Dickinson was hooked up when I purchased the boat. Either would make for a much better heating experience than the electric, but both require a significant amount of work to get going. The Dickinson needs a fuel tank installed and connected to as well as a stack/chimney. Because the roof is not finished on the boat I cannot install the stove pipe. No ventilation means no burning. Dickinsons are very popular on commercial fishing vessels and basically set the standard for marine heat. While they are amazing stoves, I’d love to replace it with a propane stove that would be more easily controlled for cooking instead of being primarily for heat. UPDATE: Our infrared heater had a little, ahem, issue recently. A little popping sound, a little burning smell… Yeah. So, we were two days without heat in early October. (Note, my youngest son had used a pair of dog nail clippers on the cord of the heater just days after we purchased it. The “fix” didn’t last, causing things to overheat. So, I don’t think it was a problem with the heater, but with a damaged cord.) I had a backup heater, one of those oil-filled radiant type, but the switch was broken. That darn thing was in our way all winter and summer and to find out it was broken was aggravating! Space is such a premium! A friend and former co-worker came to the rescue with a nice Bionaire heater. I had looked at it at Costco and considered it hard. I don’t know how it will do when things get in the teens and single digits, but it’s doing ok in the 30s and 40s! How awesome that I”m saved some cash by a friend’s goodwill! 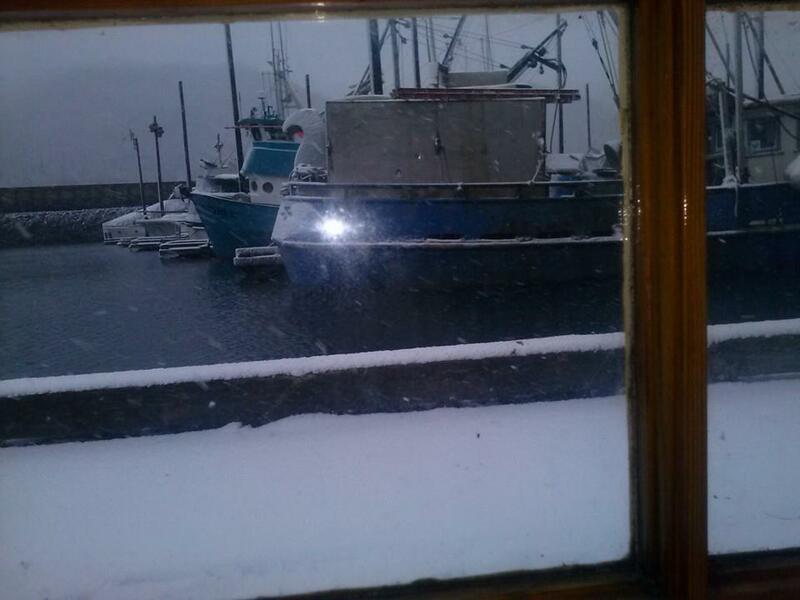 This entry was posted in Practical Matters, Staying Warm on October 7, 2014 by outofthebilge.